It would be difficult to dispute the benefits of urban trees when it comes to air quality and public health, but Thomas Leo Ogren would like to interject. Allergy problems are worse today than ever before in our lives. Deaths from asthma continue to climb each year at an alarming epidemic rate. In our urban landscapes we now have the most manipulated kind of city forest ever seen. In the past twenty years landscapers have grown inordinately fond of using male trees. In dioecious species (separate-sexed) there are separate male trees and separate female ones. Female trees and shrubs do not produce any pollen, ever, but they do produce messy seeds, fruits, old flowers, and seedpods. Landscapers and city arborists consider this female byproduct to be "litter", and they don’t like to see it lying on our sidewalks. As a result we now have huge tracts of these litter-free or 'seedless' landscapes in our cities. What these actually are, of course, are male clones. As males their job is to produce pollen, and that they do! Even though in many cities we have less total vegetation than we used to, we have more pollen in our air now than ever before. It's the same old culprits: municipal budgetary restraints and culturally constructed views of Nature, which are in this case, pristine, uniform, certainly not messy, and definitely not variegated. In nature separate-sexed plants are usually about 50/50. Half of them are male and half are female. The female plants catch pollen from the air, remove it from circulation, and turn it into seed. Female trees are nature’s pollen traps, natural air-scrubbers. In our modern cities though, female trees and shrubs are rarely used any longer. Of the five most available street trees for sale now, four of the top five are male clones. Because no one bothered to consider the effect of the pollen from these male trees, we now have many elementary schools, ringed with male shade trees, and full of asthmatic children. Pollen counts exceeding sixty thousand grains of tree pollen per cubic yard of airspace have been found in elementary school yards. What does this mean? Simply, it means that on these playgrounds, every child there is inhaling several thousand grains of allergenic pollen with each breath of air they take! And people are surprised that childhood asthma is so common now? we need trees but your right no one will care for them. And the result is a fruitless variety of tree is chosen by city/govt. projects and urban developers. Individual buyers are lazy in their shrubbery picks too. Instead of fresh oranges of a tree in a yard that used to have one. No one took care of it so now stands an obnaucious yearound bloomer they feed their kids dyed fruit and rely soley on stock holders to supply them with all their food supplies. seems foolish to be all at the expense of convenience. Lets all buy air filters! ha! what a waste. Hi, I am allergic to tree pollen. More publicity is needed to alert the public about the planting of too many male trees in our cities. I live in Toronto, a city of ravines and parks full of pollinating trees. Now they're planning to plant 2,500 more trees and shrubs this summer and I'll bet most of them will be male trees. Who cares if a female tree is messy in a park or beside a stream in a ravine? 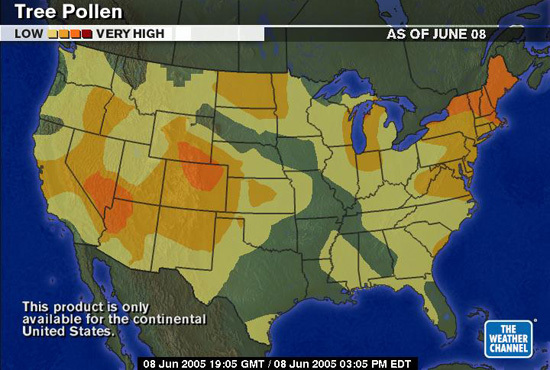 Let's demand more female trees and rid the air of all this pollen!!! Wow! You'd think that the Public Works Department in cities around the world would be required to know this? This goes to show that people who have the responsibility to manage our cities are not educated enough, and/or ignorant of human environmental needs especially for children. Who's at fault here? The City Governments of course, because they hire these brilliant people.